UPDATE: Now that we have finished building our house I have a new paint post up that shows all these colors in action. You can click here to see how the colors look in each room! I’m feeling pretty good about all of the colors. The only one I’m not so sure about is the Functional Gray, anyone out there have a room with Functional Gray walls? It’s for my son’s bedroom, he wants a Pirate theme. Thanks to our trip to Disney last week (his favorite ride was Pirates of the Caribbean) he has grand plans of a pirate ship bed, cannons coming out of his wall, a barrel of rum in the corner (completely appropriate for a 5 year old…) and a plank to walk. Yeahhhhhh…my plan is a little more subtle. Maybe some vintage maps on the wall and some old Pirate ship art? One thing we compromised on is he really wants brown walls – “so it feels like the inside of a ship mom!” I showed him the warmer gray paint chip of Functional Gray and he said “close enough!’ It’s a little darker and warmer than I was planning on (but better than the poop brown he wanted), so I’m still thinking on that one. Also, that is the last time I ask a 5 year old boy for decorating advice! The Topsail for my daughter’s room is the same color that we used in my parent’s Florida house – you can check out more pics here. 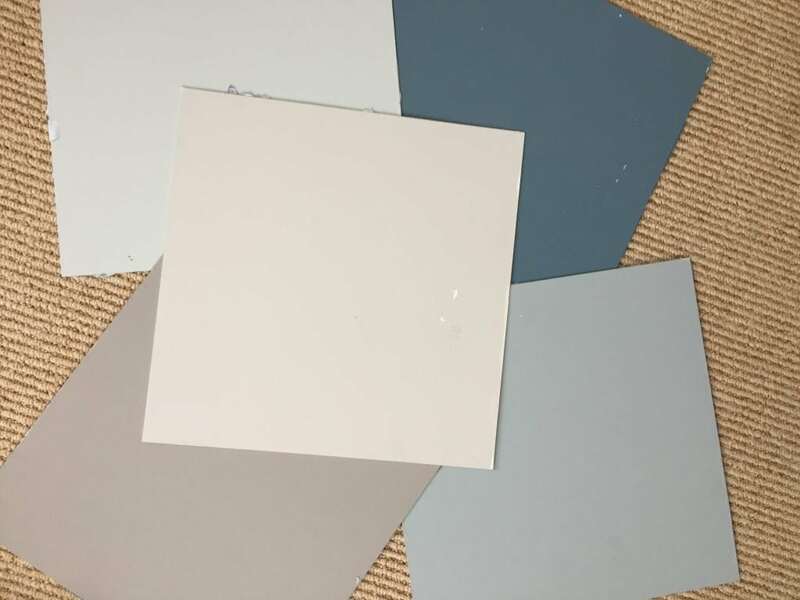 The Newburyport Blue I used on the laundry room walls at our old house (check it out here), but this time around it’s going on the cabinets in the basement and little man’s bathroom. 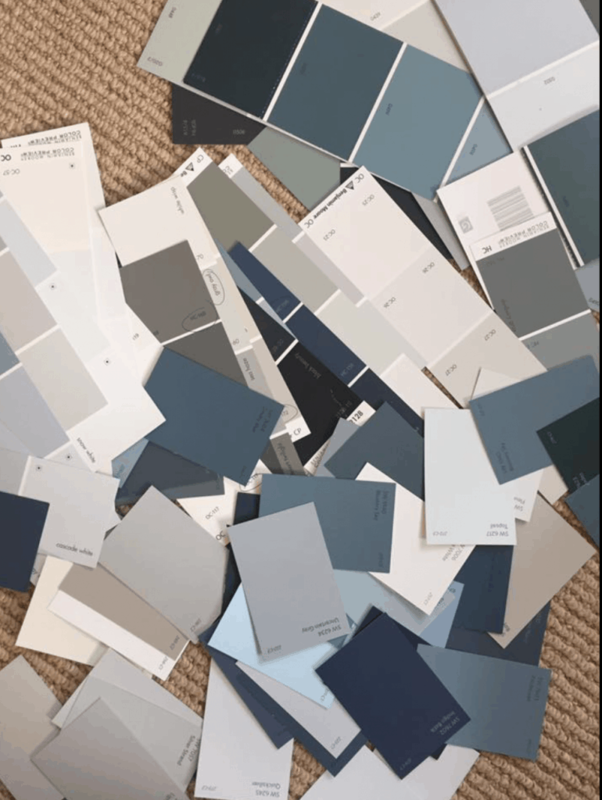 The only other color giving me pause is the Blustery Sky Blue color for the kitchen island and our master bath cabinets. Painting such a bold color on cabinets scares me a bit, but the rest of the kitchen is going to be all white and I want the island to feel like a separate piece of furniture. The master bath cabinets are going to get the same color, which makes me even more nervous, but the floors are white in there and a big section of the walls will be too, so I think a pop of color could be fun! One tip I did do this time around was grab sample cans of the paint and paint large sections of poster board. I took them to the house this weekend and held them up on all the walls, checking them in different light. Crossing my fingers I made good choices this time, I’ll keep you updated if I change my mind! I have made more mistakes with paint than I can count! I like your combos that you’ve chosen. I like they will blend well. My local Pottery Barn has Functional Gray on one of the wall in the store, and it looks great. It’s a beautiful warm gray color. I’m planning to use it somewhere in my house. Thanks for sharing! Love the color combination.. Especially Love the Blustery sky blue! It will be georgous! All look wonderful. Have u posted your tile for the bathroom? We are replacing the tile in our bathrooms at Lake of the Ozarks. Would like to see your choice. Wow your new house looks amazing. Can’t wait to see your kitchen as we are redoing ours soon. I haven’t, my flooring posts for the whole house is coming soon, probably in the next 2 weeks? Stay tuned! I think your color choices are beautiful and perfect for a home on the lake! May I ask one question? From your notes, it appears that your trim and wall color in the living room will be the same color. Is that correct? Thanks. Your home is going to be gorgeous (just like your former house). I have learned so much, just by viewing your blog. Thank you so much for sharing your fabulous ideas with us! Hi Donna, yes so our living room is actually going to be paneled in a flooring to ceiling board and batten treatment so it will be the same color as all the trim. I really want the view to stand out so I’m painting all the main areas white but I wanted the texture of the board and batten treatment, hope that makes sense? Thanks! I had a similar color on my kitchen island in my last house and everyone, including me, loved it. Fear not! Oh good, thanks for the confidence boost!! So much depends on the light in the room, I like your idea of painting large poster boards it allows you to move the color around the room and see what it looks like in different lights. I think your colors look great together! Good luck! I Love all your wall and trim colors. I also love how they blend together. My only concern is the “White Floors”. Our kitchen and bathroom floors are white or ivory. They are so difficult to keep clean. BTW, it is only me and my husband living in our house. Our light, medium and dark shades of hickory wood floors are so much easier to clean. Just my opinion but please think twice about your floors. Hi Linda, we had white floors in our last bathroom too and didn’t have any issues :) They are tile that look like white washed wood so they have grey in them too which I think helps hide the dirt. I love the sofa pictured in the photo of your parent’s home (I believe). It is linen colored with aqua piping/trim. We are looking for that exact couch for our northern cottage! Do you have any information on that sofa? Love what you’re doing with your new home. Beautiful! She bought it at a local store in Florida, I don’t have any info on the brand sorry. Just painted a guest room / office Silver Strand and it is the greatest color! Depending on the time of day/lighting, it is either grayish blue or blueish green/gray. It is awesome- good luck! OH that sounds perfect thanks Jen! Do you know what colour or have you already picked a colour for the main bathroom? Love your color choices! I’m a Michigan girl myself, Detroit suburbs! My husband and I are thinking of building or renovating a home. So I have a question about kitchen cabinets. 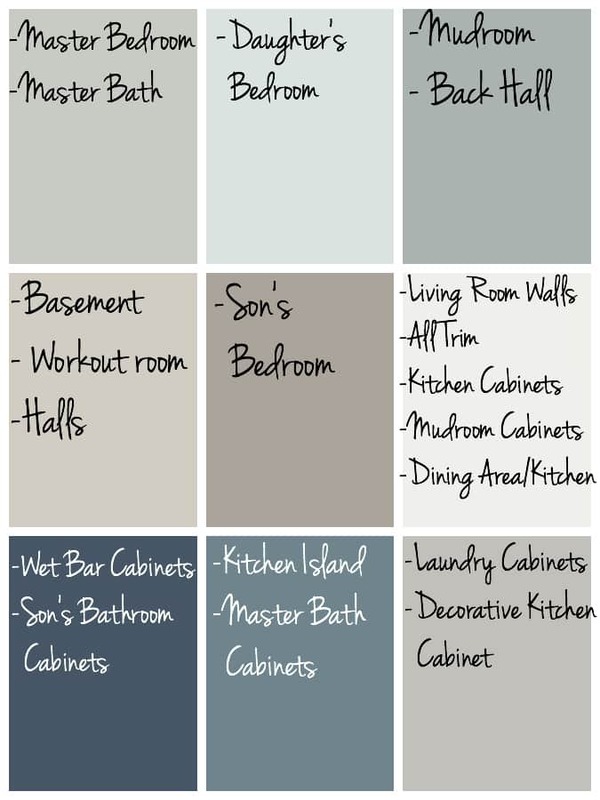 Looks like your cabinets will be sprayed the colors you’ve chosen. Will most kitchen places do this or do you order them unfinished and hire a painter?? Might be a dumb question, but I’ve always wondered how to get a specific color, rather than a stock color. Can’t wait to see the final outcome! Hi Stephanie, if you want them a specific color you probably have to have them custom built and sprayed. 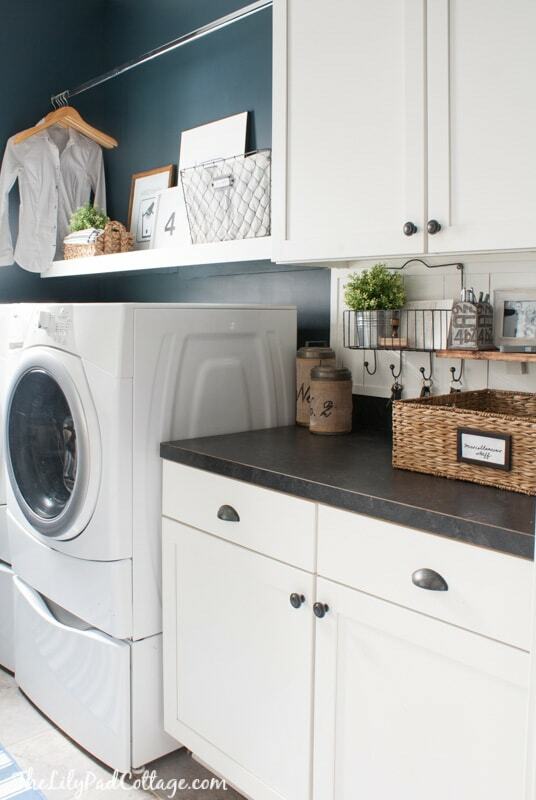 Although a lot of kitchen places offer cabinets in all sorts of different colors now so you could probably get something close to what you want. Good luck! We recently bought a lake/beach house and are in the process of renovating. We used your lakehouse paint recommendations from your former home as reference. We love our new colours. Similarly we went with a brown hue for the boys room to feel like beach sand. We chose revere pewter and love it! The other color we used was sea salt and pallamedo blue. Love both. Are you using outdoor siding indoors in the living room? We’re debating about using concrete fibre shiplap siding for large accent wall. When do you expect to reveal your bathroom tiles selections? That’s been tough for us. 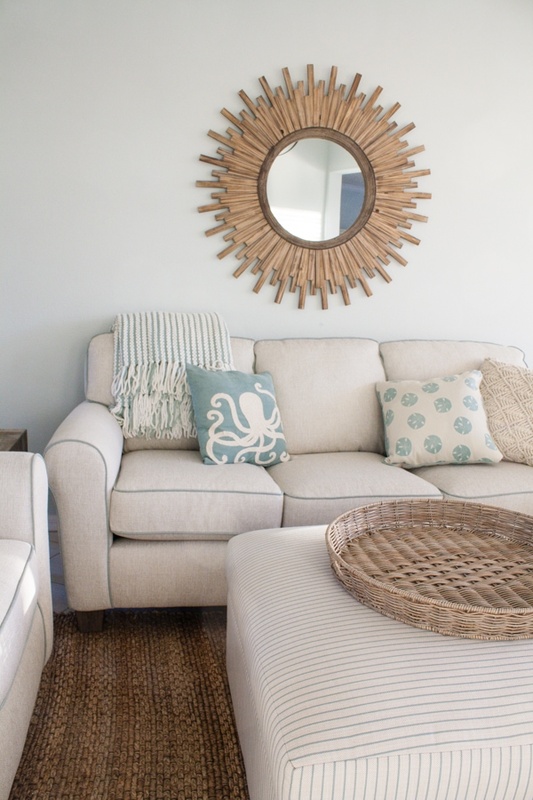 Love your new place and look forward to the full reveal! Hey Johnny, the guys are doing all the woodwork on the walls but outdoor siding could work too I think! I’ll be talking about my flooring selections next week on the blog – thanks! Love your colors. I’m using a similar dark sky blue above a white board and batten in our hall bath. It reads very gray blue. I tried painting poster board but have had better luck using those small packs of canvas boards to test my samples. There are also smaller boards that are great to keep in your bag when shopping for accessories. Is there a blog post listing your former home’s paint colors? They are all so pretty too! Hi Pamela, if you search paint colors in the search box it should pop up! Hi Kelly, I’m in love! Your choices on everything are so beautiful. I am a huge fan of white walls as well. Did you paint both the trim and walls all the same white? Could you please tell me what sheens you selected? I am so grateful for this info Kelly as we are about to do some interior painting as well. Thank you for sharing! Did you post your exterior colours? I can’t seem to locate them. That’s up next on our Reno list. Can’t wait for your next Blog to arrive! Hi Wendy, we didn’t post exterior colors because we used vinyl siding so it’s whatever color it came in. What sheen did you go with on the kitchen island? I need help with exterior paint colors. Our home is on the lake and has so much going on architecturally that I am so lost and can’t find a happy color. I will not probably be able to repaint in my life time so this is a major decision for me and could use your help. I would love to send you some pics if possible. Thank you so much and love all your colors. Was the Functional Gray a Pottery Barn paint color? I think it was thanks! Moving to Michigan soon myself, after a 20 absence. I have been following your blog, with interest, for inspiration. Love your lake house colors. My question is: in your photos of the kitchen, your island looks much brighter than what you have indicated by your paint colors here. Is your island really Blustery Sky or another color? It’s really Blustery Sky but I have a ton of natural light in my house so it doesn’t look as dark as it is on the paint chip. I’m sure if you have less light it appears darker. Hi! What color did you go with for ceilings? I’m building and I’m using a lot of similar colors to your home. Thank you! I am sorry if you’ve already answered this, but what brand are your paint colors? They are beautiful and a great combination! 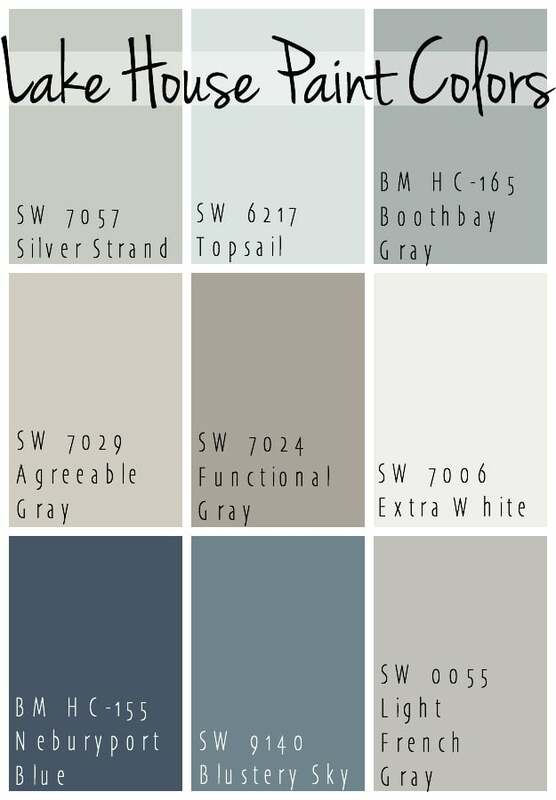 The ones that say BM before the code are Benjamin Moore the ones that say SW are Sherwin Williams. Thanks! I found you on Pinterest and am so excited to use this color pallet at my lake house! I will post pictures when it’s completed. Thank you!! I love this blend! What brands are these paints? They are sherwin williams and Benjamin Moore. Thank you, so much for this post! I love your house! You have done an excellent jog decorating. I am in the process of redoing a small bathroom at our summer house in Glenn and was wondering what finish do you use for the walls in the bathroom. Right now I have a shiny finish ( painted years ago) and I just don’t like it. what do you suggest. Hi Cindy our bathrooms have matte paint in them, I think if you use a quality paint you don’t need to adhere to the old rules of using a higher gloss paint in bathrooms. We haven’t had any issues at least – thanks! LOVE these colors. Where can i find the same swatches? What brand paint are they from? I’m with Lavonne….what paint brand is this??? What color did you use on the exterior? Yes, go to my site and take our “new house tour” you will see it all finished :) I need to update this post for sure! I would love to see the wetbar painted with the darker blue! Hi, Your homes are beautiful! What is the exterior gray paint color on your old house? Thanks! I’ve been planning to replace our couch and I like your couch! Where can I buy that same couch, if you don’t mind me asking. We went with Satin on the board and batten and matte on the ceilings thanks! I’m thinking about painting the island and lowers in our new home (not yet built) blustery sky, with uppers white, counters white. Do you have a pic you can send of your cabinets and are you happy with the color?